Thanks to the hours I work at my job now, I had a lot of time to play handheld games this last month. I plowed through a lot of them. Which is casing me a problem: I am running out of 3DS games to play. Sure, I’ve got a healthy library of PSP games to get through and sizable stack of regular DS games left. Anyway, that really inflated the number of games I played last month. When I first started playing this I kind of hated it. While it looks great, the main character’s sprite takes up too much of the screen leaving little room for anything else. Like where you are supposed to be jumping to. Plus, it starts out really hard. You can only take a couple of hits and your basic hair attack has too little range. The game gets easier as you go along, since you get more hearts and abilities, but it never fixes the hair or screen size problems. Shantae is a game chafing against the restrictions of the GBC. It wants to be Monster World IV, but the system isn’t powerful enough to allow it. The second half of the game, though, is really good. Once you grow used to some of the games limitations, there is a very fun game here. I thought I needed to hurry to beat this before its sequel hit, but it turns out that it is coming out a few months later than I had hoped. Still, I am again very excited for it. Shovel Knight: wrote about it here. 1001 Spikes: wrote about it here. This game is beautiful, both visually and aurally. The use of rhyme for all of the dialogue is something of a mixed bag. It works most of the time, but if the game had been any longer than Child of Light’s ten hours it would have likely grown highly annoying. I am simply glad this game exists. It is an RPG from Ubisoft using the tools they made Rayman Legends with. 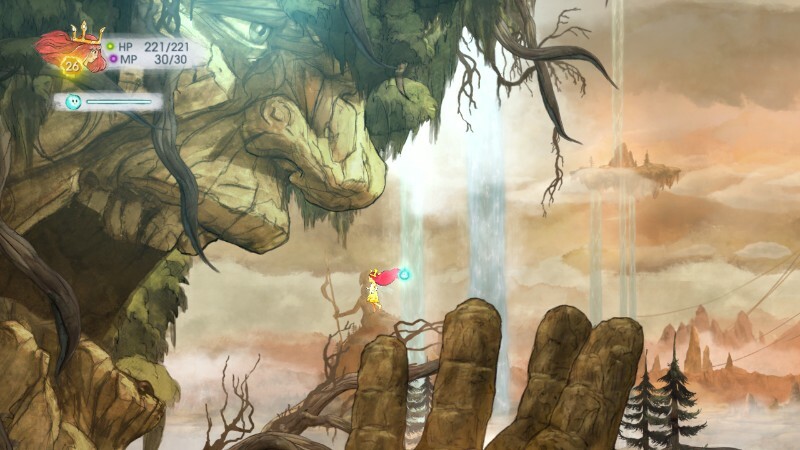 There is some light platforming here, but mostly it is just an RPG. Along with looking and sounding great, the battle system is also excellent. It works largely like the Grandia battle system, with every character represented on a line showing when their turn is coming up and the focus of most of the battles is to manipulate the timing to delay your enemy’s turns and maximize your own. It doesn’t get as complex as it could have, but it is explored pretty well for all the longer the game is. I hope this was a success for Ubisoft and we can get more gems like this. This game would be a great tragedy if Cave Story didn’t exist. Ikachan is not really a great game. It might be too short to even consider it a whole game. But it looks really good and there is just something charming about the world and characters of this game. 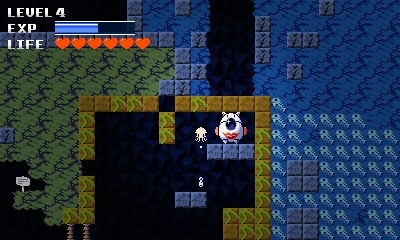 That look and charm translated perfectly into Cave Story, one of the true indie classics. It took everything that Ikachan did well and did it better, plus it did so much more. Ikachan feels a little like a rough draft or even just an outline of a game. It is fun enough, but there just isn’t enough there. Plus, some of the movement limitations can be annoying. I’m glad I played it and I’m glad I only paid 2.50 for it. It is a fine supplement to Cave Story, but doesn’t really stand on its own. Mario Kart 8: wrote about it here. Zero Escape: Virtue’s Last Reward: I saw one ending, though there are nearly a dozen in this game. I don’t feel the need to play this anymore. It is a visual novel with some adventure game puzzles. Which means it lives and dies by its story. And I don’t care much for that story. Not because the story is poorly written or anything; it is just not my cup of tea. This one is just not for me. Super Mario 3D Land: I beat the main game last year and loved it. A couple of weeks ago I got the itch to play it again and powered my way through the last few of the special worlds. The early part of the game is too easy and the very end is too hard. But that middle ¾ or so are just excellent. I really like this game. Every level is just so creative and inventive. Best game on the 3DS. SMT Strange Journey: I cleared Eridanus and moved on to the next area. I love this series and I love other first person dungeon crawlers, but this one sometimes is more tiresome than fun. Hopefully I am about to turn a corner and start enjoying it again. Inazuma 11: I pushed through another story mission. This game isn’t quite clicking with me. 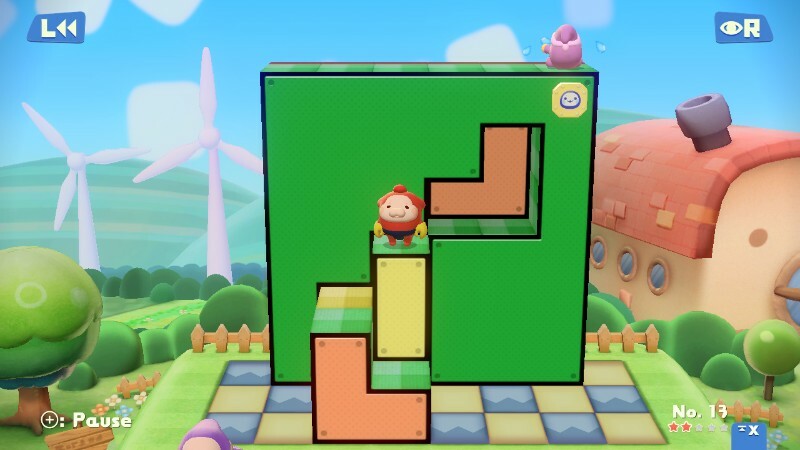 Pushmo was a lot of fun. The first fifty of these puzzles are just as fun. I can’t saw it adds a whole lot to the formula, but it is such a great formula that it doesn’t matter. I don’t know how many puzzles are here, but I expect to keep working through them, and player created ones, for quite some time. Final Fantasy Tactics: War of the Lions: I’ve already wrote some about this. It is still FFT. It is still easy to lose hours and hours just learning skills. I hope for this to be a short playthrough (ie 45ish hours) and have been pretty efficient in learning important skills. Legend of Zelda 4 Swords Adventure: I’ve cleared the first world. Like the mode from the GBA Link to the Past port, this is like Zelda the arcade game. It is different from the usual Zelda experience, but still a lot of fun. The most disappointing part is that I’ll never get to experience this game the way it was intended, since I’ll never get to play it with three other people with their own GBA’s and link cables. Still, it is a lot of fun. Assassin’s Creed: I’ve written about this already. I’ve almost finished it. Yumi’s Odd Odyssey: I’ve beaten the first ten levels and the first boss. I can’t for the life of me get to either of the extra exits. I really like what I’ve played of this game so far, but I fear I will never be able to experience any more of it. 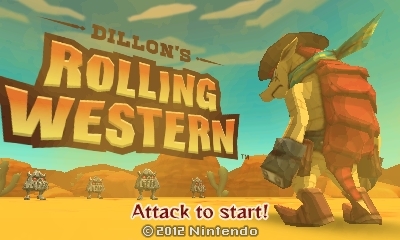 This is one of those DS games that are simply designed for right-handed people. I am not right handed. Therefore, I have great difficulty playing this game. I like it, but maybe not enough to put up with the hassle and actual, physical pain associated with playing it. If I can figure out a way to comfortably control it I’ll probably finish it up right quick. Remember Me: I am about a quarter of the way through this game. It does a great job of creating a world, but not such a great job of giving the player interesting things to do. It is just a beat-em-up with some light Prince of Persia climbing around. The setting when allowed shine, is breathtaking. I don’t know that I am going to stick with it long enough to beat it, but I’m glad I’ve seen what I have of it. Persona: The start of this game is unfriendly. It does a bad job of communicating to the player just how the game works. I was muddling through pretty well, though. At least, I was before I got distracted by Tactics. I’ll get back to it soon. I’ve already chosen my path and last party member. Resident Evil 5: My brother and I are going to play this together in the next couple of weeks. Despite my absurdly low tolerance for horror, I do like this series. Mostly because even the scary games aren’t all that scary. Not that not being scary stopped RE4 from sending my crying out of my room occasionally. Baldurs Gate Enhanced Edition: This game and its sequel are the only games I allowed myself to buy in the Steam Summer Sale. I’ve played through the first 2 chapters of Baldurs Gate a lot, but never gotten much further. I really want to see it through this time. Legend of Zelda Minish Cap: It came to the WiiU VC, so I’m getting on it, though it will have to compete with 4 Swords for Zelda playtime. I am going to finish up this Zelda series replay before the end of the year, I swear it. Tom Clancy’s Ghost Recon Shadow War: I saw it in an eShop sale and couldn’t resist. Plus, I am running low on unbeaten 3DS games. I’ve heard good things and like strategy RPGs, so we’ll see, but it will have to wait until I finish FFT before I really dig into it.